Most birds build nests that don’t stand out. Muddled bundles of twigs you hardly notice—in fact, that is the point. Not so the bowerbird, native to Australia, whose nests are sculptural wonders. Male bowerbirds are nature’s perfectionists, shaping spherical nests they then decorate with berries, sticks, and found trinkets. “Nest” is too humble a name for the dwellings they concoct; they are the architects of the bird world, the I. M. Peis of the avian kingdom. Male bowerbirds are also excellent dancers that like to boogie down during courtship, but that’s another story. This has a human corollary. If so much commercial design seems resigned to remain drab and purgatorial—the neutered neutrals of waiting rooms, of putty-colored carpets and wishy-washy walls—there is a movement afoot to reimagine and reinvigorate these previously unsung spaces. Such is the mission of Bowerbird Design Collective founded in 2016 by Laura Zoulamis and Melanie Scamman. Like their namesake, they create highly curated interiors and are every bit as fastidious, innovative, and industrious as their feathery friend. At their office in Saco Mill, some hallmarks of biophilic design are readily apparent: exposed brick, natural fibers, lots of plants, and plentiful light. A Chesterfield sofa, Eames chair and ottoman, and Bertoia diamond chair surround a wool Flokati rug. The partners met at a previous firm. 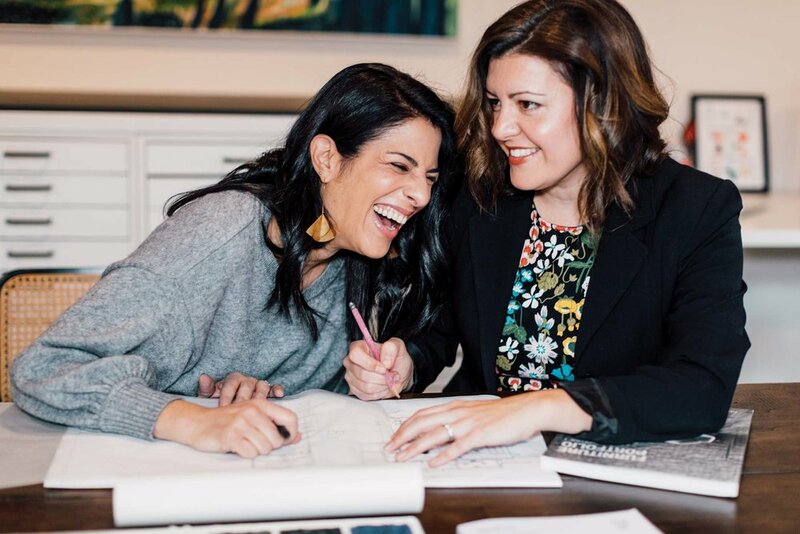 With their kindred aesthetic and considerable experience in the commercial realm, the leap to start their own company felt natural. Their services include all aspects of design, from building to branding, and they have quickly become known throughout the state for their modern, sleek, holistically integrated interiors. Zoulamis, at her desk, which enjoys a view and the company of many plants. Scamman reviews a drawing. Zoulamis (in background) stands before “Beach Roses” by Eric Hopkins on loan from Elizabeth Moss Galleries. “People spend so much time in their offices that it’s paramount that they feel empowered and inspired in these spaces where they spend 8 to 10 hours a day,” says Scamman. Their aesthetic hews closely to the natural world, using organic and sustainable materials whenever possible, from ecologically minded companies like Interface and 3form, as well as prioritizing ambient light and incorporating plants, wood, and natural stone walls. This commitment to creating environmentally friendly as well as pleasing spaces helped their client Evergreen Credit Union in Windham become LEED certified. For the Machias Savings Bank branch installation in the historic Casco Bank Block in Portland’s Old Port, Bowerbird created an envelope within the existing building. Fondly called “our jewel box,” it showcases the original tin ceilings and Corinthian columns while on-trend midcentury furnishings, custom cabinetry, and millwork feel hip and urban. Interface carpet tiles wittily mimic the pattern of the cobblestones outside. Zoulamis works on a project with Bowerbird’s draftsperson, Judith Bernier. Whether working with an existing space or starting from the ground up, Bowerbird listens to the needs of their clients and finds fresh ways to achieve environments that are as effective as they are attractive. A recent collaboration with Portland-based Mark Mueller Architects involved transforming the former Cole Haan headquarters in Yarmouth into the offices and labs of Tyler Technologies, a 95,000-square-foot campus that included a 100,000-square-foot addition. Among their many innovations, Bowerbird flipped the original runway room to create an auditorium and built a lab featuring interactive screens for software demonstrations. For a meta-touch, they added sculptural lamps throughout called DNA from lighting manufacturer Beta-Calco. 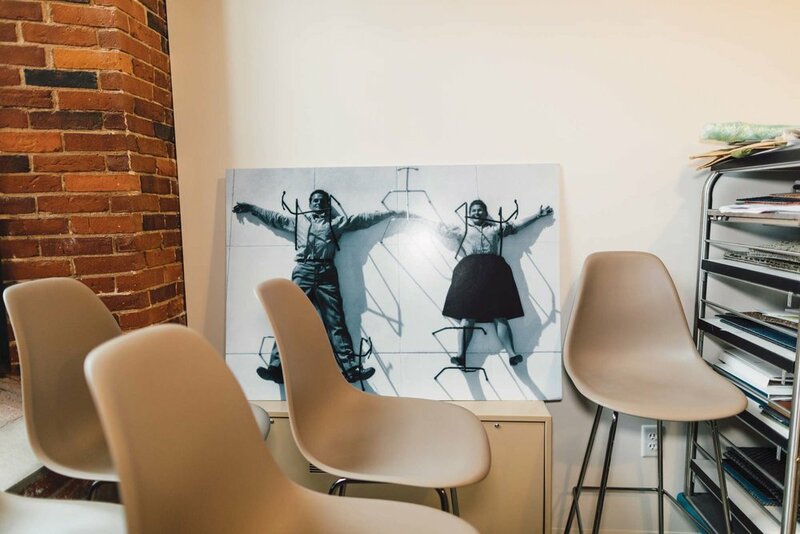 A grouping of vintage fiberglass Chromcraft chairs before a photograph of Charles and Ray Eames. A stroke of such ingenuity occurred while creating a workspace for the Ethos/Vont marketing firm in Westport. When budget cuts made certain hoped-for features, like wood walls, seem a dim possibility, a lightbulb went off. Scamman’s father, a supervisor of a warehouse, had access to hundreds of wooden pallets. Bowerbird returned to the client with a unique proposal: “We’re going to have a pallet party!” exclaimed Zoulamis. Zoulamis’s golden retriever, Bowie, the office “greeter,” beside an Eames chair Bowerbird created called “Pacific Palisades Gardens” after Ray Eames and the gardens of her California home. Ethos employees joined the duo, and Scamman’s father and husband in the sanding and staining of the pallets. They ordered pizza and got to work. The payoff—offices with hand-finished rustic wood walls—is nothing short of spectacular. That this solution was born out of necessity rather than as an intentionally planned splurge is hard proof of the women’s resourcefulness and sheer can-do-ness. Most recently, Casco Systems LLC, an electrical engineering company based in Cumberland, sought designs for a new headquarters. The original building was nothing in particular. “A vanilla box,” Scamman called it at the time. But shortly thereafter, she came across the very thing to give the space pizzazz: street art–style portraits of scientists by artist Dane Ault. Bowerbird commissioned illustrations of great thinkers including Nikola Tesla, Thomas Edison, and Michael Faraday (the company’s headquarters is on Faraday Drive) and made 20-foot vinyl wall graphics that greet clients upon arrival and benevolently oversee the engineers in conference rooms. They also created a “number jumble” over the copy area, fashioning a sort of puzzle with ANSI device numbers, which are used to represent various functions and equipment in the electrical industry. “And then for a little bit of fun, we hid our birthdays in there,” Zoulamis reveals. “We have fun,” Zoulamis sums up, with a laugh. The humor and wit behind their designs is surely what makes their interiors such inviting places to inhabit. One has only to walk into one of Bowerbird Design Collective’s inspired spaces to sense the enjoyment they take in their work and feel the result of their creativity and collaboration take flight. Zoulamis and Scamman share a laugh. The partners have a lighthearted rapport that makes all their hard work look easy.